26.5 by 43.5 cm., 10 1/2 by 17 1/4 in. Country Life, 14th March 1968, ill. Bright was born in Saxmundham, Suffolk, the son of a clockmaker and was apprenticed to a chemist in Norwich before turning to drawing. 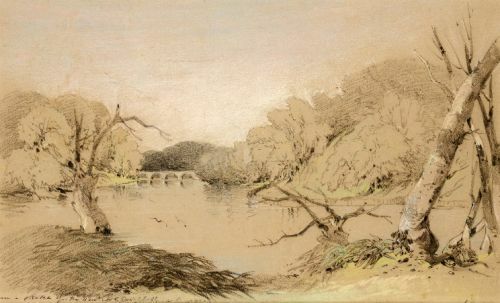 He learnt drawing under Alfred Stannard and took lessons from John Sell Cotman. In 1836 he moved to Paddington and built up a successful drawing practice in London until 1858 when he returned to Saxmundham. He lived the last years of his life in Ipswich. 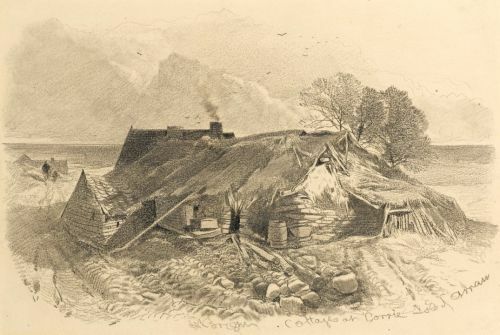 This is typical of his drawings in its use of black chalk and stump. Tal y Llyn or Llyn Mwyngil, is a large glacial ribbon lake at the southern end of the Snowdonia mountain range. 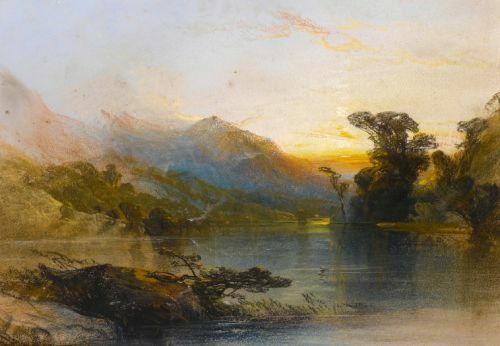 The lake is situated at the foot of Cader Idris, whose slopes can be clearly seen flooded with the light of the setting sun. 243 x 347 mm., 9 ¾ x 13 ¾ in. Bright was born in Saxmundham, Suffolk, the son of a clockmaker and was apprenticed to a chemist in Norwich before turning to drawing. 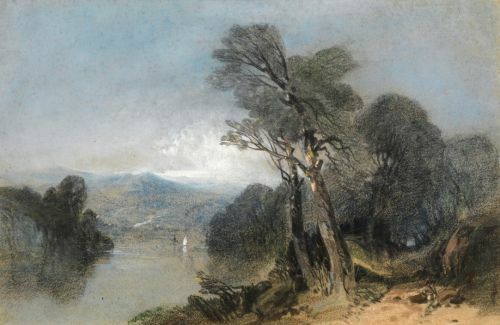 He learnt under Alfred Stannard and took lessons from John Sell Cotman. In 1836 he moved to Paddington and built up a successful drawing practice in London until 1858 when he returned to Saxmundham. He lived the last years of his life in Ipswich. He specialised in chalk drawings often on coloured paper. 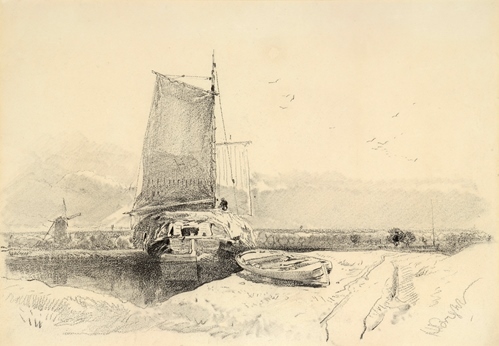 A similar drawing of a wherry by Bright is in Norwich Castle Museum (see Marjorie Allthorpe-Guyton, Henry Bright 1810-1873 - Paintings and Drawings in Norwich Castle Museum, 1986, p.93, no.75, ill.). 208 x 238 mm., 8 x 9 ¼ in. Bright was a Norwich School artist who spent most of his career in London. 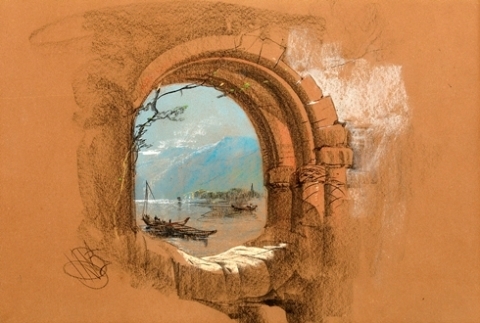 Chalk drawings of this type are typical of his later work and this is likely to be a Continental view. He is known to have visited the Alps in 1849 and the Rhine in 1851. Bright was born in Saxmundham, Suffolk, the son of a clockmaker and was apprenticed to a chemist in Norwich before turning to drawing. 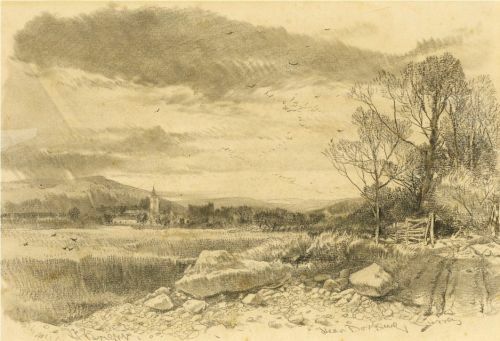 He learnt under Alfred Stannard and took lessons from John Sell Cotman. In 1836 he moved to Paddington and built up a successful drawing practice in London until 1858 when he returned to Saxmundham. He lived the last years of his life in Ipswich.